Prestigio MultiPad 8.0 Pro Duo is an affordable dual-core Android tablet with 8-inch capacitive screen and some good features and specs for a tablet from this price segment. For me it is quite strange how from an average computer accessories brand Prestigio managed to become one of the biggest tablet manufacturers. Prestigio tablets are usually quite cheap but they also offer some high-end models competing with the very latest models of the top manufacturers. 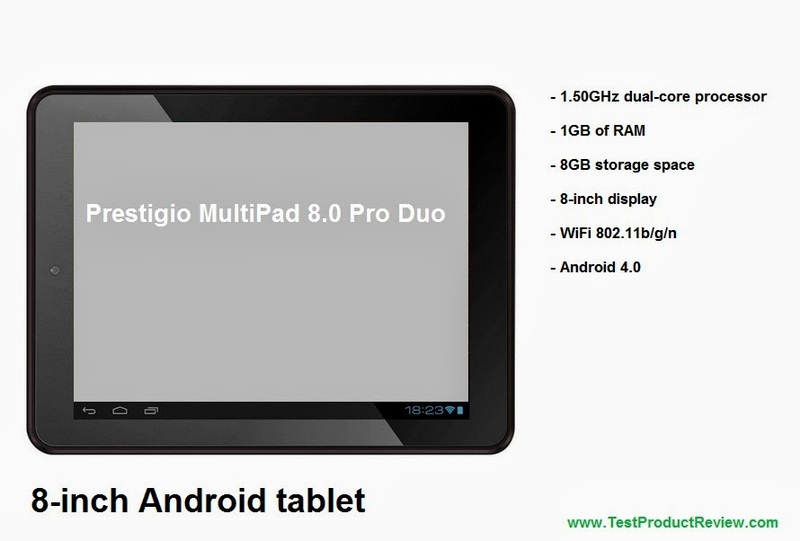 Prestigio MultiPad 8.0 Pro Duo sits somewhere in the middle, it is neither cheap nor expensive. Considering the 1.50GHz dual-core ARM Cortex A9 processor and 1GB of RAM the price of just under $200 seems quite reasonable. What we noticed in recent months is the fact that tablet manufacturers are producing more and more of their top models to be smaller than 10-inch. It seems that the downsizing trend didn't only affect car engines but tablet sizes as well (yeah, this information is quite irrelevant but still I felt like I needed to share it...). So now lets review some of the main components of this 8-inch tablet. The 8-inch capacitive multi-touch screen of the MultiPad 8.0 Pro Duo has resolution of 1024x768 which again sits somewhere in the middle of this segment, it isn't very low (same as the iPad mini) but definitely far from the latest Asus Google Nexus tablets which has amazing IPS screens with great pixel density. Prestigio MultiPad 8.0 Pro Duo has 1024MB of RAM and 8GB of storage space. You can add more data with additional microSD card - this tablet supports memory cards of up to 32GB. This 8-inch Android tablet has fast 802.11b/g/n WiFi connection for easy and fast access to the Internet but unfortunately the wireless capabilities of this tablet end here - no 3G connection (needs external dongle), GPS or Bluetooth are present in this tablet. What we have here in addition to the WiFi connectivity are the MicroUSB and miniHDMI ports. Prestigio MultiPad 8.0 Pro Duo has a 4700 mAh Lithium Polymer battery which is good enough for 120 hours of stand-by time and around 5-6 hours of active usage. As additional features the 8-inch MultiPad 8.0 Pro Duo offers 0.3MP front-facing camera and a case which is specially made for this model. Prestigio MultiPad 8.0 Pro Duo comes with Android 4.0 Ice Cream Sandwich operating system but there is option for upgrade to better performing Android 4.1 Jelly Bean. Prestigio MultiPad 8.0 Pro Duo measures 203 x 153 x 11 mm and weighs around 490 g.